Dr Richard Haass has begun a fresh attempt to end the deadlock and reach agreement with all sides in Northern Ireland over flags, disputed parades and the past. And Sinn Fein leader Gerry Adams has urged all sides to make progress in a new bid to end the deadlock and reach agreement over flags, disputed parades and the past. 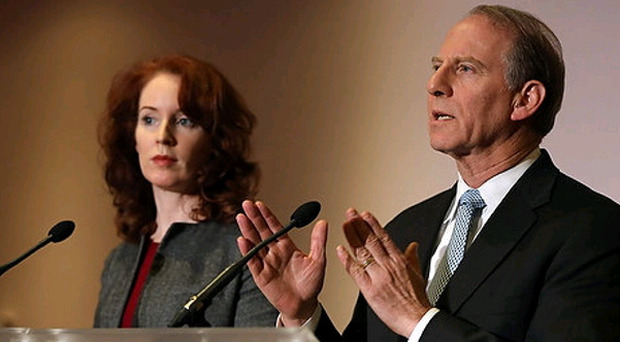 Mr Haass is expected back in Belfast on Saturday with Meghan O'Sullivan for another round of discussions. Separate talks with representatives of the five main political parties are likely before a full round table negotiations on a fresh set of proposals. Attempts failed in the run up to Christmas and Dr Haass and Dr O'Sullivan returned home - but indicating they were prepared to come back to Belfast if they thought there was a realistic chance of getting agreement on at least some of the issues. It is believed a fifth draft will be presented to the parties on Saturday and they will have until New Year's Eve to come up with a settlement. All sides believe there is a possibility they can agree on the way forward on parades and the past, but the question of flags is almost certain to remain unresolved for the foreseeable future. Dr Haass and Harvard professor Dr O'Sullivan were brought to Northern Ireland in July by the First Minister Peter Robinson and the Deputy First Minister Martin McGuinness with an aim of finding consensus on the displaying of national flags, the holding of parades and how to come to terms with the violence of the past. The Sinn Fein president said a resolution was possible, with talks recommencing tomorrow and expected to continue into next week. Mr Adams said: "There is a duty and responsibility on all the parties to these negotiations, despite the challenges, to find a way forward. With a fair wind the proposals under consideration can do this and I would appeal to everyone to overcome any difficulties which may remain." Mr Adams, former West Belfast MP and now a member of the Irish Dail, added: "Many people will be disappointed that the all-party talks broke up without agreement for Christmas. Sinn Fein shares that disappointment. "However, it is our view that progress was made and that agreement is possible when the talks recommence."